Dogs love burying their noses into the ZippyPaws Burrow Squeaky Hide & Seek Plush Dog Toy, for hours of entertainment. 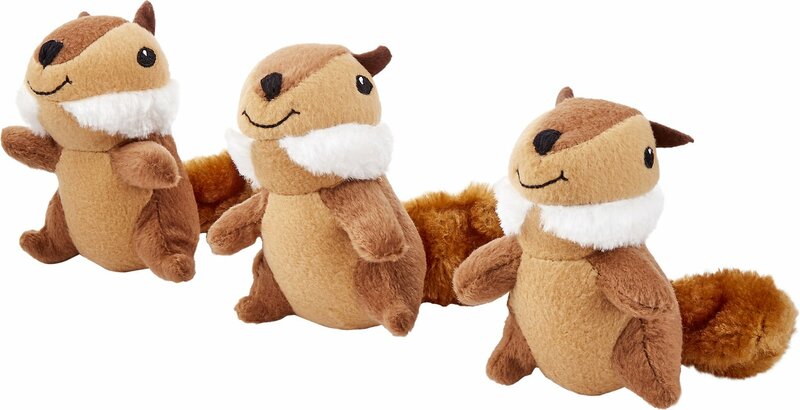 Simply hide one, two or all three of the included squeaky chipmunks in the acorn, and this interactive plush toy will challenge your dog as he works to dig them out. And for even more fun, you can purchase the squeaky chipmunks on their own. Great for small and medium-sized dogs, not suited for aggressive chewers. And it’s machine washable, making cleaning a breeze. Comes with three cute and squeaky chipmunk toys that your pup will have to dig out of the acorn for lots of stimulating interactive play. Great for small and medium sized dogs, but not recommended for extra tough chewers. Zippy Paws has some great toys! Oliver loves his Zippy Paws toys. I use to buy the whole set for these toys, as we have quite a few. I saw on Chewy you could order just the little toys inside the container they come in. It is a nice option when you have about 10 of them. I like the ones that have more detail, then the round ones. The round simple ones, he has an easier time getting the squeaker to not squeak. For whatever reason, these and the hedge hogs he can not get to it. I highly recommend these and all of their toys. Cannot say enough on how much these Hide and Seek plush toys bring joy to my two guys. They like the challenge of rooting them out of the larger part of the toy(trunk) but then it is squeaky time for hours on end. They enjoy them while playing together or by themselves. So glad they make extras of them for me to add to their set. I had previously bought the squirrels in the tree truck and my dog loves playing with the little squirrels. Carries them around like babies. They were getting a little worn so I bought these chipmunks to add to the tree stump! Nice and small. These are a great interactive toy if you have something to hide them in! As my Samoyed puppy systematically destroyed his first round of Chipmunks, I ordered these and the outward hound for comparison. For a heavy chewer, the zippy paws are better. Outward hound brand has a tuft of hair on top that is easily chewed and the seams seem looser. My pup LOVES his Chipmunks. He likes to carry them around and squeek them! He's very good at.getting them out of his tree trunk now as well. My Australian shepherd LOVES her ZippyPaws log and chipmunks. I ordered these replacement chipmunks for the log she got for her birthday. She carries one around everywhere she goes. :) It came with three- she's lost one, and chewed the feet and ears off another so I thought Santa better bring more to replace them! I'm so glad these come separate from the log. I originally bought the whole thing and my dogs only played with the squirrels. They love to carry them around and hide them places. I buy new ones every couple months as they inevitably get lost! My dogs love them! My little fur baby loves these and the other little critters they are available in. The only problem is they need to be made with a little stronger materials so they last a little bit longer. My Shih Tzu, Darla, loves this toy! I have already ordered her extra chipmunks!